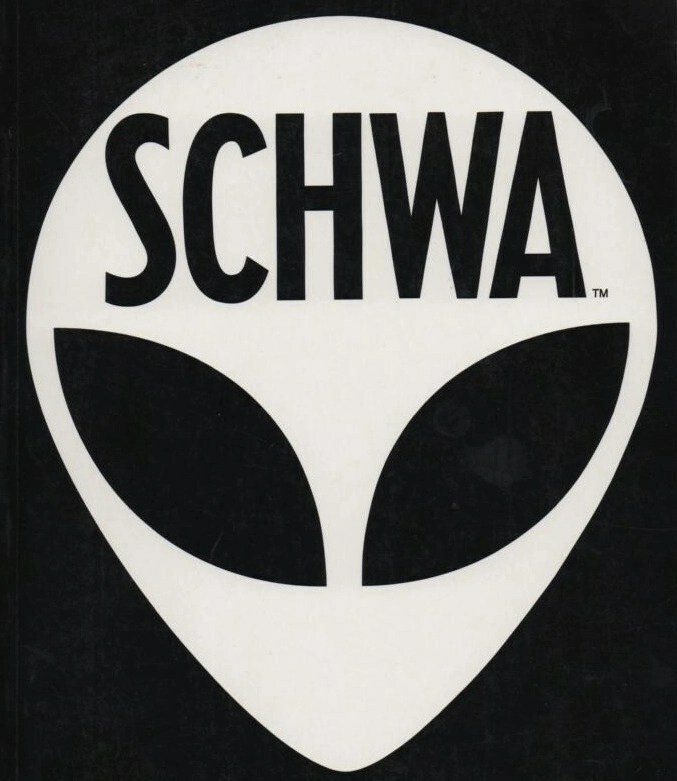 Twenty years ago, William Barker's Schwa artwork revealed a world of alien abductions, stick figure insanity, conspiratorial crazy, and a hyper-branded surveillance state. It's now more relevant than ever. In the early 1990s, adman/fine artist William Barker's Schwa became the iconic artwork of the cyberculture underground. Barker's paranoiac stick figures, faux-corporate undertones, and conspiratorial overtones embodied the high weirdness of the time. And of course there was that alien head, that damned alien head. Loved by everyone from Terry Gilliam to Noam Chomsky, Barker unveiled the Schwa world through several books, Web experiments, t-shirts, prints, calendars, and comic strips that appeared in the bOING bOING print 'zine among other places. Now, Barker has re-opened the portal to Schwa with a new Etsy shop - -alaVoidDistribution - where you can purchase original Schwa artwork, the books, prints, ephemera, apparel, and other manifestations of the other within ourselves. Below, a brief interview with the man behind the madness, and a handful of his favorite artworks, annotated by the artist himself. Boing Boing: What was the idea behind Schwa? Barker: On the broadest level, Schwa is about a corporation that stages an 'alien' takeover of a b&w planet through machines, branding and advertising. Some of the stickpeople notice the deception. There aren't any aliens in any of the books, only logos, signs, dreams and thoughts. Why do you think it resonated so much at the time? Hyper-corporate branding had begun just a few years before. Some of us noticed. I chose the alien head to stylize into a brand with its weak pun on 'alienation'. Soon after, interest in aliens, one of the great modern myths, broke out for the third time. I may have sensed that early. And, the 'zine scene was about to boom for few years, a scene I had no awareness of when I started. I caught both those waves. Why do you think the time is "right" again? The World Operations Manual came out in late 1997. Out of 25,000 copies printed, 10,000 sold. The rest went into bargain bins. In ways that's a good thing, many people who were too young or not born have found the books in bins, on shelves and thrift stores. They are new fans, and those books are nearly the only view they've seen that questions and ridicules living on a branded planet. And, there are a lot of security cameras in the drawings. A prophecy, apparently. 'Planet' 1992, from the Schwa book: This is the first drawing where I used my invented, freehand spherical perspective. The most reproduced of my drawings, it's been used on t-shirts, posters, postcards and limited edition prints. 'Factory' 1992, from the Schwa book: One of my favorite drawings, it creates a dreamlike place outside the ordinary universe. It's the final image in the book. 'Crowd' 1994, from the Counter-Schwa book: The cross-hatched face is one of two places in any of the drawings where I break the B&W style rules for Schwa. This drawing is in the animation made in 1996. 'Bar' 1996, from the Schwa World Operations Manual: This one's self-explanatory, 'read' the stickpeople from left to right. I affectionately call it 'The Asterisk Bar'. 'Zilch' 1994, Cartoon: This drawing was the only one I tried printing in 'comics' color, it was printed in the University of Nevada Reno student paper. It didn't look good. It also generally sums up my thoughts on aliens. 'Bath' 1992, from the Schwa book: A stickperson at home. I like the black water and soap. 'Highway' 1992, from the Schwa book: This drawing has been used in a number of places, most recently as an illustration in Gareth Branwyn's 2014 book, 'Borg Like Me'. It reminds me of Nevada sans abduction. 'News' 1992, from the Schwa book: A good example of my freehand, curved 4-point perspective drawing style. It's also the first one where I began to use repetitive figures as an effect that was later used in many drawings. For more on Bill Barker, visit his Facebook page, alaVoid.